Last week I discussed Wright’s “seven generalizations” about populations. His seventh generalization, that there were multiple selective peaks, led him to develop his famous “adaptive topography” metaphor. As Provine (2001) discussed, there is considerable controversy over exactly what Wright meant by an adaptive topography. My understanding is that Wright never meant his topography to be a formal model, and as a result much of the ambiguity may be the result of Wright himself not being clear. There are three big ambiguities that need to be resolved before his adaptive topography can be formalized. The first is whether a point on the adaptive topography refers to an individual or a population. According to Provine, and I am inclined to agree, Wright himself was ambiguous on this. If you look at the pictures in his 1977 book (and 1932 paper) it appears to me that he is thinking of a point on the topography as being an individual. The reason I say this is that in that paper the populations are drawn as regions on the topography, implying that indeed an individual represents a single point. I think this makes sense and I will stick with that. The second issue is what are the axes. Since I have announced that a point on the surface represents an individual, the vertical (z axis) is the fitness of an individual. More problematical are the “horizontal” axes. There are two problems with these. First what are they? In the literature you can find examples where the axes are different trait values, and thus aspects of the phenotype. Indeed, the experimental literature almost entirely treats the axes as if they are some aspect of the phenotype. The problem with this is that we would like the adaptive topography to give insights into evolutionary change. With gene interaction it is quite possible to have two different genotypes giving the same phenotype, and to have these genotypes be incompatible. This is not hypothetical issue: There are several examples of outbreeding depression in crosses between organisms that are phenotypically very similar (e.g., Edmands 1999 Evolution 53: 1757-68). Unfortunately these populations, to the extent that they have the similar phenotypes, would show up on the same area of the adaptive landscape. From Wright’s discussion it appears that he is, at least at times, thinking of the axes as aspects of the genotype, possibly allele frequency. Of course this leads to it’s own problem. If the axes are allele frequencies at a pair of loci, and the points are individuals, then for any given individual the value of an axis can only take on three values, 0, 1, or 2 copies of a particular allele. Nevertheless, from Wright’s figure it is clear that he is thinking of the axes as taking on continuous values. Gavrilets (1997 Trends in Ecology and Evolution 12, 307-12) handles this by suggesting that the axes take on discrete values, but that it is more convenient to represent genotype space as a continuous function. Also, there is the problem that fitness is a function of phenotype, not genotype. The final problem with the horizontal axes is that in most illustrations of Wright’s metaphor there are three axes, but of course, there are vastly more axes. If we include loci in our topography, we need say one (or several) axes for each locus, and if we take the view I have been pushing, we would need axes describing the nature of interacting partners and cultural milieu the number of axes becomes very large indeed. Thus, the final ambiguity becomes what should and should not be included in the horizontal axes? Here is where this becomes an opinion piece: Can we come up with a way to put all of this into a single framework that allows a more formal modeling? I think we can. The way I would resolve this problem is by embracing the complexity, and recognizing that there are a near infinite number of axes, and certainly more than we can deal with. We should also recognize that conceptually there is a mapping from the combined patterning and nonheritable factors to the phenotypic compartment. Finally we need to recognize that only the phenotype affects fitness. I suggest that since it is only phenotype that affects fitness, the first step in developing a general is to consider an adaptive topography that has aspects of the phenotype as the horizontal axes. This actually saves us nothing since, for example, differences in alleles at a locus are actually chemical sequence differences in the DNA, and that aspect of a gene is part of the phenotype (Oh well.) Also, there will always be aspects of the phenotype that we don’t (either can’t or choose not to) measure. Thus, again we are back to our problem of a plethora of axes, certainly more than we can deal with, and some that we are unable to deal with. Generally, we will be interested in only a few traits (measured aspects of the phenotype). If we measure a large number of individuals for those traits and for fitness (have fun with that) then we are in effect doing an orthographic projection onto those traits. The result will be that different individuals with the same phenotype at the traits measured will have different fitnesses (what else is new). The fitness value at any point will then will be similar to the genotypic value of quantitative genetics. That is it will be the mean fitness of an individual who has the values of the measured traits at that point, averaged across all other aspects of the phenotype. Of course, we can’t forget that we are frequently interested in genotypes. To deal with this it seems to me we can imagine that there is a lower level much larger set of axes representing the patterning compartment (genes, and other heritable factors) and the environmental compartment (non-heritable factors). The genotype (e.g., patterning compartment)-phenotype map leads to a much larger set of axes, and different genotypes that map to the same phenotype. (image copied from http://en.paperblog.com/genotype-phenotype-maps-and-mathy-biology-317240/ who cites: A testable genotype-phenotype map: Modeling evolution of RNA molecules. In: Lässig, M. and Valleriani, A., editors, Biological Evolution and Statistical Physics, pp. 56–83. Springer-Verlag, Berlin, 2002). 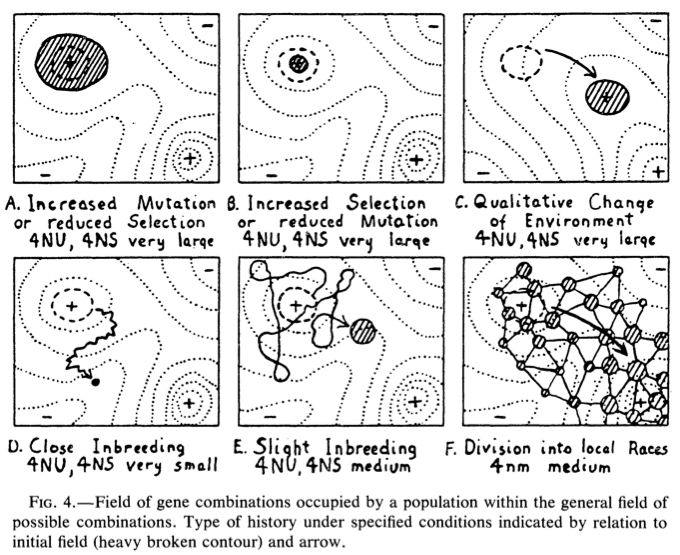 The immediate effect of this is that because different heritable elements can create the same (or vanishingly similar) phenotypes, this means that in translating from a phenotype based topography to a patterning compartment based topography the same phenotype (and thus the same fitness) will be represented on different parts of the graph. Again, if we are interested in only a few loci (or other aspects of the patterning compartment) then we can do an orthographic projection onto those loci, and proceed with the subset. 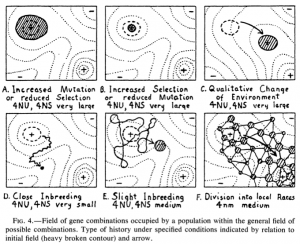 Also, it is probably useful to remember that a topography with genotype or other heritable elements as the horizontal axes is itself a projection from an underlying topography that includes also axes associated with non-heritable aspects of the environment. Thus the point of this essay is that we can incorporate all of the different concepts, including the horizontal axes representing phenotype, or genotype, or more generally any heritable element, or even non-heritable aspects of the environment. The result is that the underlying conceptual topography is impossibly complex, nevertheless we can work with the concept by imagining that we are doing orthographic projections onto the elements of the genotype or phenotype that we are interested in. The nice thing about this is that, like the phenotypic view in general, this is an open ended view of adaptive topographies that can be easily expanded to include things like social interactions, or contextual traits. As a final note: if this essay sounds a bit confused, it is because I am also confused by this topic. This entry was posted on Thursday, May 29th, 2014 at 2:23 pm and is filed under Uncategorized. You can follow any responses to this entry through the RSS 2.0 feed. You can leave a response, or trackback from your own site. No, it traces to Sewall Wright. Wright meant it as basically an illustrative metaphor, and I suspect he was a bit upset when people took it a bit to seriously. Gavrelets did do the world a service with his holey landscape model, however, if for no other reason than that he showed that Weight’s model was to simplistic. Thank you for the excellent commentary and also enlightening comment section. 1. Choose models with good AIC’s, given all available data, doing functional validation when possible. 2. Always be expanding the families of models that we consider in our analyses. Once we have defined our spaces (radical quantitative intersubjectivity? ), we can unveil the relationships & processes that link these levels. As Jeremy Draghi says, this parsimonious set of functionally-defined dimensions will define a manifold in the higher-dimensional space, so “valleys” in a given single dimensions can be easily teleported across. landscapes. As far as I know this idea originates with Gavrilets and holey fitness landscapes. I think Bjørn is exactly right on this, and he is certainly more of an expert on the topic than I am. I am inclined to think that Gavrilets makes the good point that high dimension topographies need not behave like low dimension topographies. However, a real understanding of how they differ will require more research. You keep calling me out on points I raise as an afterthought. You have the makings of a great editor. My statement about fitness being a function of phenotype rather than genotype was shorthand for saying that we really need to not lose sight of the fact that selection operates on phenotypes. You are, as usual, correct that in principle a mapping of genotype to phenotype should be possible. Jeremy, this is a common worry, that there is an inherent difference between the topography of low- and high-dimensional landscapes. As far as I know this idea originates with Gavrilets and holey fitness landscapes. That mathematical argument assumes that there is no correlation between neighboring genotypes and fitness, which we know is not true, plus it ignores the sparseness of the neutral network. There is no evidence of any sort that real multidimensional landscapes create nearly-neutral networks that populations can traverse. Also, all the evidence so far points to landscapes being rugged with multiple peaks – though admittedly both the artificial and empirical landscapes investigated are not of very high dimensionality. 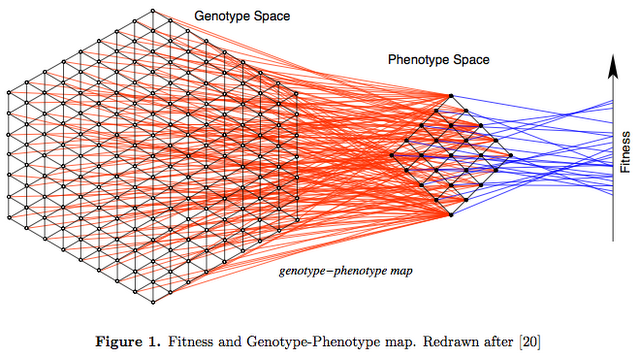 While fitness is of course a function of the phenotype, one can well measure fitness for each genotype and make a genotype-fitness map. I don’t think this poses any problem. This strikes me as a great summary of a confusing topic, but I’m curious if you think that Wright’s adaptive landscapes, as a mental model, might do more harm than good. As you note, the concept is tightly linked with the notion of multiple peaks and the problem of crossing adaptive valleys, and the complaint I have heard is that the kinds of low-dimensional landscapes that we can draw and think about inevitably exaggerate the importance of ‘valley-crossing’ in evolution. If populations can actually evolve in many directions or make large jumps, then the apparent problem may disappear. I’m not sure if I agree with this argument myself, nor do I have a replacement framework in mind for describing complex genotype-phenotype-fitness mappings–I just worry about how these kinds of informal models can limit our thinking.